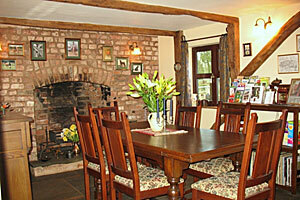 The cottage is furnished to a high standard with a sympathetic mixture of antique and modern solid wood and upholstered furniture. Wherever possible, new furnishings were sourced from local suppliers in line with our policy at Nutshell Bed & Breakfast to support local trade. 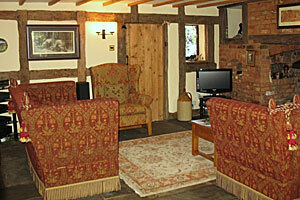 Soft furnishings and curtains throughout the cottage are made by my close family friend, Sandra Missenden. The dining room is flagstoned, with a small inglenook fireplace and dates back to the 18th C. With windows facing due east, the room benefits from the early morning sunshine with views across the nearby fields. The large antique oak drawer-leaf refectory table and oak “butler’s table” are complemented by Old Charm oak dining chairs, dresser and sideboard (the antiques of tomorrow!) from Gloucester Furniture Exhibition Centre. Breakfast is served on local traditional country stoneware pottery from Winchcombe Pottery. 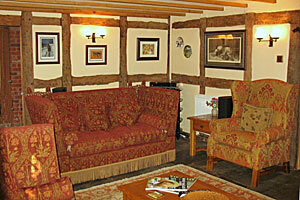 The private lounge is made available to guests on arrival late afternoon for tea or coffee if requested. 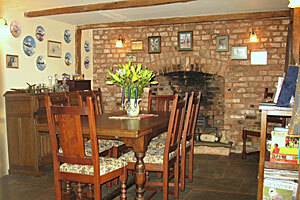 The main part of the large L-shaped lounge, dates back to the 16th / early 17th C and features original oak beams and a large inglenook fireplace, complete with bread oven. A recent addition is the log burning Jotul stove supplied and fitted by Gloucester Stoves, providing the safe option and “best of both worlds” between the idyll of the open fire-basket and the practicality of the wood-burning stove. 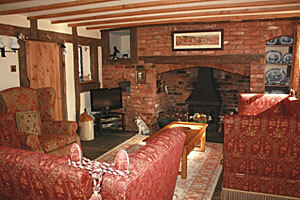 The beautiful sofas and chairs were made by Rouse of Cheltenham and Afghan rugs supplied by Jennings of Tewkesbury. 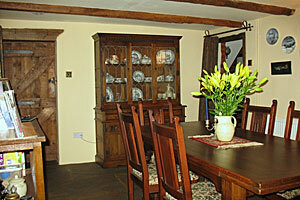 The room also features modern oak furniture and an antique oak court cabinet. 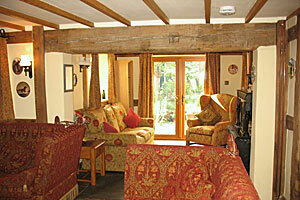 The lounge was extended in 1991 into its current L shape, taking care to remain in keeping with the period features including traditional flagstones and beams. 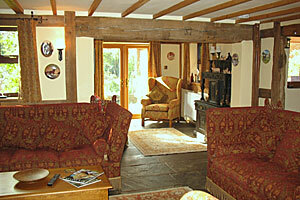 The French doors in the extension open onto a small south-facing patio. 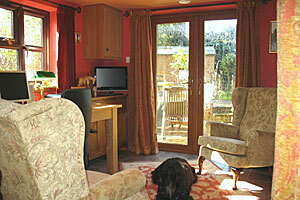 The study is a bright sunny room overlooking the front driveway and rear patio. Glass fronted oak bookcases run the length of one wall, housing a wide variety of books, both fiction and non-fiction and an extensive selection of foreign language dictionaries. 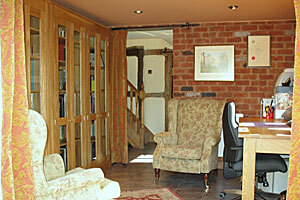 Please ask if you would like to peruse or borrow any books during your stay. Usually the two very comfortable Parker Knoll chairs, from Gloucester Furniture Exhibition Centre, are shrouded by dog blankets, as my two young Afghan Hounds, Aysha and Layla consider these make perfect "dog beds"! Appropriately the rug, from Jennings of Tewkesbury, is Afghan! 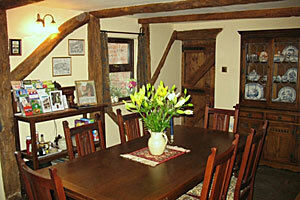 The French doors from the study open onto the large rear patio, also accessed from kitchen.